... maybe you saw my garage-cleaning post today. Or the one about about the most pierced woman in the world (over 6,000 pierces). If you were quick you saw those posts. If you weren't you didn't. I deleted them. They just didn't suit me. Hmm. Maybe I'm getting too perfectionistic in this blogging hobby of mine. 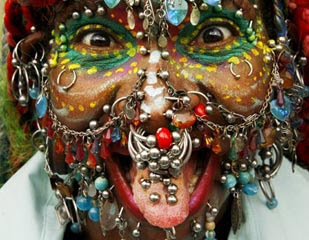 Also, in the spirit of imperfection I'm going to show you the picture of that pierced woman after all. I knew you wanted to see her. Whoa!!! I'm glad that is not one of my kids! crazy! perhaps she thinks she has reached perfection in all her piercing. ... I'm not even sure what to say... other than that HAS to be painful... and when she takes all of those out, she might resemble a pin cushion. That looks like it hurt!!! Did you change your blog name to Busyness instead of Business?